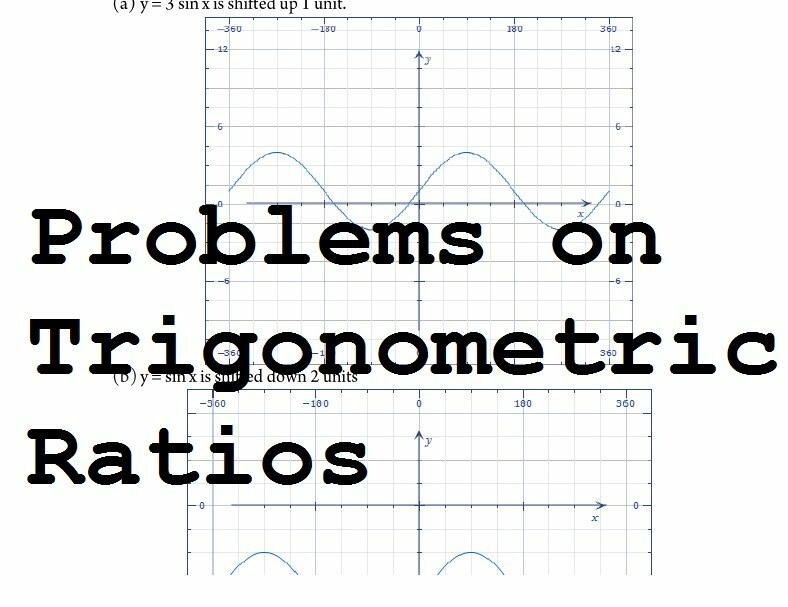 In this tutorial, we'll try to apply the basics you learnt about Trigonometric ratios, identities and compound angle formulas. 1. Convert 6 radians into degree measures. 2. The angles of a triangle are in A. P. and the number of grades in the least is to the number of radians in the greatest as 40 : 7 π, find the angles in degrees. 3. Assuming the average distance of the earth from the sun to be 92500000 miles, and the angle subtended by the sun at the eye of a person on the earth to be 32', find the sun's diameter. 4. If cot x = – 5/12 , x lies in second quadrant, find the values of other five trigonometric functions. 5. Prove that (cosec a - sin a) (sec a - cos a) (tan a + cota) = 1. 6. Find the values of sin 75° and cos 75°. 8. Given cos 330o= 30.52 ,find the values of sin 165° and cos165°. 9. Given tan15o=2-30.5, find tan (7.5 degrees). 10. When A + B + C = 180°, show that sin 2A + sin 2B + sin 2C = 4 sin A sin B sin C.
11. Find the maximum and minimum values of 4 cos x + 3 sin x on the interval 0 ≤ x ≤ 360o. 14. What is the most general value of θ which satisfies both of the equations sin θ = - 12 and tan θ = 13 ? 15. Solve the equation 2sin 2 x+3cosx+l=0. 17. Show that the values of the trigonometric functions of an angle θ do not depend on the choice of the point P selected on the terminal side of the angle. 18. Let a and b be nonnegative real numbers. (a) Prove that there is a real number x such that sin x +a cos x = b if and only if a2 − b2 + 1 ≥ 0. (b) If sin x + a cos x = b, express |a sin x − cos x| in terms of a and b. 19. Let f be an odd function defined on the real numbers such that for x ≥ 0, f (x) = 3 sin x + 4 cos x. Find f (x) for x < 0. 20. Let x, y, z be positive real numbers such that x+y+z = 1. Determine the minimum value of 1/x+4/y+9/z. cos a + cos b =62. 22. Region R contains all the points (x, y) such that x2 + y2 ≤ 100 and sin(x + y) ≥ 0. Find the area of region R.
23. Express sin(x − y) + sin(y − z) + sin(z − x) as a monomial. 25. Prove that cos 1o is an irrational number. 26. Let a and b be real numbers in the interval [0, π/2]. Prove that sin6 a + 3 sin2 a cos2 b + cos6 b = 1 if and only if a = b.